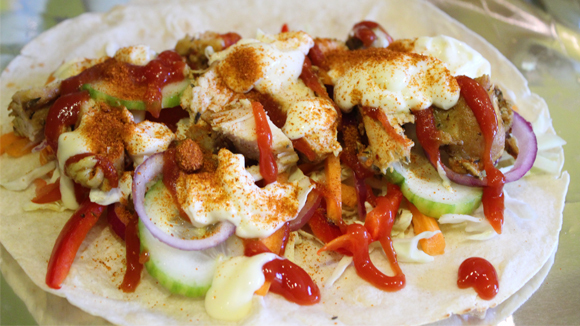 Shawarma is gradually becoming a major treat for Nigerians as almost everyone is always on the run and would prepare a quick meal. Are you thinking of treats to make for your guests, family or even yourself, then you are in luck as you can now prepare a chicken shawarma with these five easy steps. Season the chicken breasts to your taste preference and leave in the fridge to marinate for 30 – 45 minutes. Add two tablespoons of oil to a frying pan, take out the chicken and place it in the pan. Add a little oil and keep moving chicken in the pan to different parts until they are a little brown. Take the chicken breasts out of the hot pan and slice longitudinally on a chopping board. Set aside and leave it to rest. Place your flat bread on the foil paper, then lay over the sliced or chopped vegetables in any manner. Add the sliced chicken breasts on top, scoop on Mayo and Ketchup with a sprinkle of dry pepper. Roll the wrap gently, then wrap with the foil paper. Place the wrap in the oven or a deep frying pan and let it heat up for 5 minutes.